Ken is a shy young man and loves to bury himself in studying his books. To his own surprise, he gets the opportunity to a rendevouz, but the evening with the unknown beauty turns out different than expected. When he wakes up, badly injured in a hospital, he is horrified to discover that some of his organs have been replaced. But that's not all, because in Ken awakes an unknown craving, an ever-increasing hunger for human flesh. Unstoppable, he transforms into a creature of the night. With Tokyo Ghoul, Sui Ishida created one of the best-selling mangas of the last decade. Director Kentaro Hagiwara has now succeeded in turning the black-romantic model into a horror city fairytale which will not only delight genre lovers. In dark and stylish pictures and with the necessary hardness he creates an intense atmosphere that captivates the viewer. The successful cast of the leading roles could convince even the most critical fans that Tokyo Ghoul is one of the best manga real film versions of the last few years. 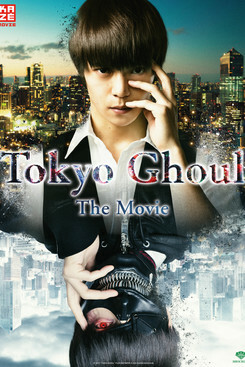 Tokyo Ghoul - The Movie wurde auf dem 19. JFFH 2018 gezeigt.